Okay. You may know that I was involved in my third--yes, third--murder investigation recently. I still don't know why so many murders have occurred lately in my wonderful adopted town of Knobcone Heights, California. Nor do I really like getting involved. But I was the main suspect in the first one, and some friends became suspects in the second and third. Enough already! Or so I hope... though I suspect that's not the situation. Meanwhile, I can live my life normally now, or at least that's what I intend. I'm the owner of Barkery & Biscuits, a bakery where I sell the healthy dog treats that I created, and also its adjoining human bakery Icing on the Cake. Plus, I still work part-time at the Knobcone Veterinary Clinic as a vet tech. That's where I developed my recipes for the Barkery. Just so you know, though, my most recent investigation was described in a book called Bad to the Bone. 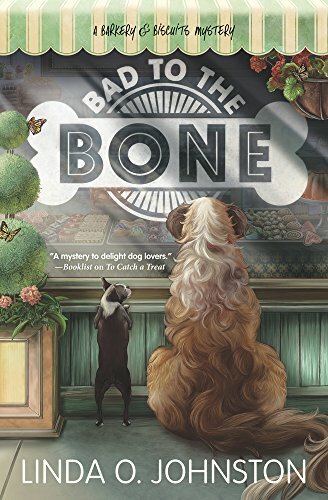 And because that situation has been resolved I'm going to give away a copy of Bad to the Bone to a U.S. resident who leaves a comment here along with contact info. I'll have my wonderful dog Biscuit randomly choose a name on Monday. So... what do you think of dogs, doggy treats, and people treats? I love them all. We used to have dogs but my daughter developed an allergy. What is life without treat? We all need them even my furry friends. I love them all, especially people treats! Thanks for the chance to win. I have beagles----of course, we must have lots and lots of treats! I wish we had a healthy treat store around our neck of the woods. Our dog currently loves baked sweet potato treats. They take the place of rawhide treats. I have certainly enjoyed the first two books of this series and am looking forward forward to reading Bad to the Bone. The recipes for people and for pups are an added bonus! Both of my cockers, Mercy and GloryBee, are crossing their paws that Biscuit picks their momma's entry!! I love dogs, I love making my dogs homemade tgreats, and people treats are amazing! Thank you so much for the chance to win! I haven't read any of the books in this series yet. It looks great! I am glad to hear that the series is continuing. I miss my doggies, so I'm stuck enjoying people treats and wonderful memories. bobwiesmann(at)gmail(dot)com. Fun post! Our dog's favorite treat always involved peanut butter! Thanks! I love dog's. I had a faun boxer that was a great member of our family. Of course, he loved dog treats, but give him a marshmallow, oatmeal cookie sans raisins, or a scoop of vanilla ice cream and he was extraordinarily happy! I love dogs and probably spoil my dogs with too many treats. But, they are family after all. Would love to read "Bad to the Bone". One of our elderly neighbors likes to borrow our dog for company on a weekly walk. Our dog loves it as he always gets dog treats when they finish the walk. No pup but two kitties that love their treats. And then one of my kitties begs for popcorn when we have it. Looks and sounds doggy delicious. I love dogs and my two love treats. I love reading books with dogs as characters, also.